We are always saying the best way to see a place is to get out on foot and just get lost. Well, that is exactly what we did in Nairn, Scotland … without even planning on it. We started our adventure in the most mundane way possible. We didn’t even know we would be going on an adventure (and isn’t that what makes the best ones). Chris and I decided to go take a little walk down to a jetty, but go around to a side that we hadn’t been on before. The walk would only take us about five minutes and we could try for some unique shots of the town and beach from a new angle. Well, we left our Airbnb cottage rental later in the evening (the sun doesn’t set until about 9:00pm) expecting to get some shots and get back. The air was cool, but the sun was pleasantly warm. It was the perfect weather combination. As we got to the jetty we realized the the tide was low; very low. Chris and I looked at each other and immediately knew what the other was thinking. We wanted to get to the bridge. You see, there’s a bridge a little while walk down the beach that we spotted a few days ago. The bridge is on the other side of a little “river” that flows from the marsh to the ocean. When we had first visited the spot the water was too high to cross and we couldn’t get to the other side. To add to our wonder, the bridge seemed to lead straight into an enchanting forest. It was like something out of an old fairy tale. The bridge, the beach, and the forest. So, we made a decision. We would skip our original plan and take the trip to the bridge. Maybe the water would be low enough so that we could cross our river. Or, if the tide was low enough, we could just walk the low tide wet sands the long way around and end up on the other side. The tide was very low and the sand smushed beneath our feet as we neared the spot where we would be on the other side of the water flow from the marsh. The sun was setting in the sky and we were given amazing views as the weather held out. We forgot how long the walk down the beach was from our rental because by the time we reached the bridge our Fitbits read that we had walked 20,000 steps this day. Fortunately, we always bring some snacks and water in our packs and there were still plenty of hours of daylight. No fear. Besides, we could always just come back the way we came (and the phone doubles as a flashlight, right?). We went all the way around the water flow, through low tide, over a path in the marsh, and finally we arrived at our goal. The bridge! We excitedly crossed and entered the forest. As we wandered this beautiful collection of trees we listened to the birds and the waves. Chris pointed out that we were really in the country. There were no sounds of passing cars or planes. We couldn’t even hear any signs of others in the area. We figured we’d gotten this far, so why turn back now? Besides, the path in the forest was leading back in the direction we had come. Maybe the trail had an exit somewhere near town. So, we decided to continue our journey along the pines. After a little while and a few breaks for pictures we came to a fence. The path led around the fence and some trees. Around the corner we were greeted with a farm and some cows. The forest had ended, but we still had some walking to do. We walked, talked, and walked some more. The sun was still hanging low in the sky letting us know that we were moving in the direction we wanted. Eventually, the path gave way to a small parking area with a sign and map. It told us that we had actually been walking through a national park called Kingsteps. Outside the park we found that we were thoroughly in the countryside of Scotland, a few miles from our quaint town of Nairn. From there we continued our trek towards the town and back to cottage. Though we weren’t in any real danger and knew generally where we were, the adventure was still there. We also had the opportunity to see and experience parts of Scotland we had not seen before. Getting lost and wandering is the best way to experience any new place in your travels. Image Source: Nicki Mannix Many people plan a vacation to a big-name city at least once in their lifetime. And when that city is on the coast—it makes the trip even better. 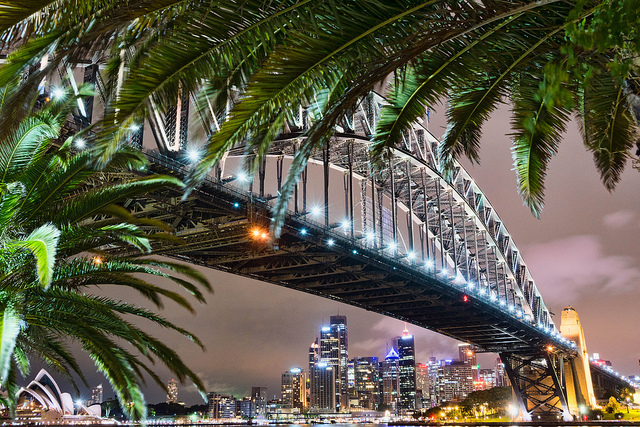 Sydney, Australia is a major destination for tourists around the globe. The city itself has so much to offer as it is surrounded by one of the world’s largest natural harbors and is home to the Sydney Opera House, the Sydney Harbour Bridge, Sydney Tower, museums, and city parks—you could spend your entire trip in the Land Down Under. But the great secret of Sydney lies just outside of the city, experiencing the striking scenery. A short drive away, you have your choice of mountains, vineyards, or beaches. 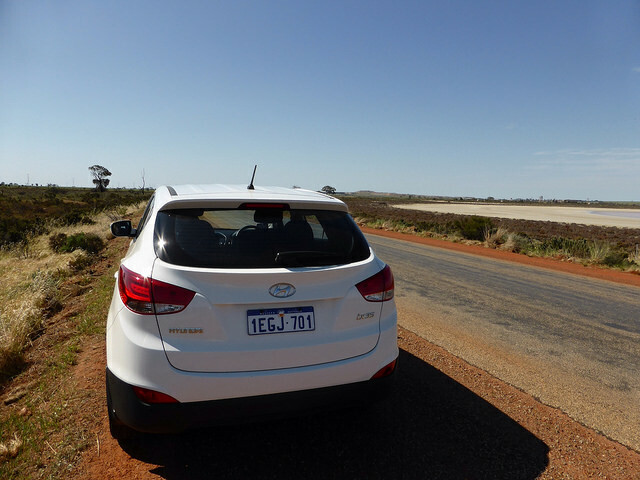 Hop in the car (on the right side if you’re driving for all you Americans) and savor your experience of these fun and scenic day trips outside of your Sydney hotel room. A favorite drive from Sydney is to the Blue Mountains, named for the hue the mountains take on when looking at them from a distance. An hour and a half drive on mostly freeways brings you into a mountain range that covers an area roughly the size of Belgium. 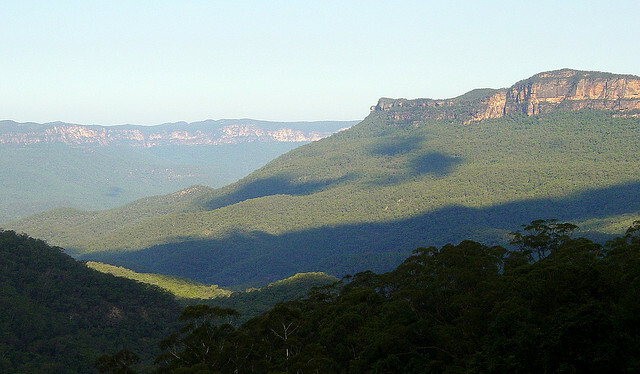 The Blue Mountains also house a variety of features, such as a rainforest, waterfalls, canyons, wildlife, and flora like the Wollemi Pine. Wollemi Pine is one of the oldest and most rare trees in the world. Although the history of the tree dates back 200 million years, it was only discovered in 1994. 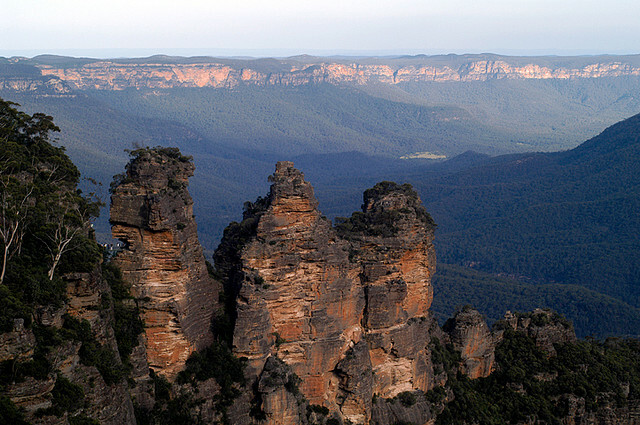 The most spectacular landmark of the Blue Mountains is the Three Sisters. It’s not a rock band, but rather a formation created by erosion from wind, rain, and rivers. Towering over the Jamison Valley at 3,000 feet above sea level, Three Sisters is a stop that will change your perspective on nature and life. 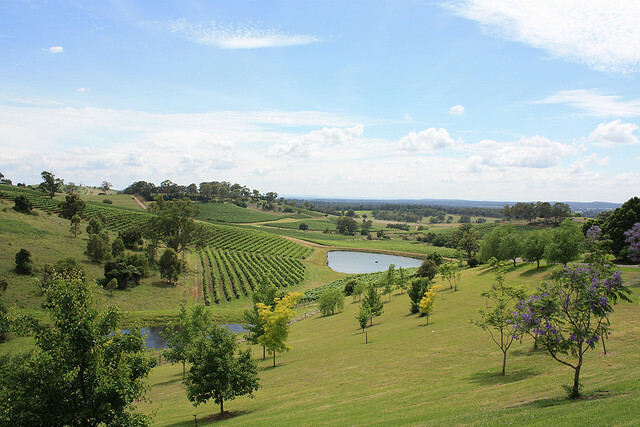 Just two hours from Sydney, you’ll discover Australia’s oldest and largest wine growing region.Hunter Valley will provide you with a day of beautiful scenery and exceptional cuisine. The vineyards are so picturesque that you’ll want to spend every minute you can checking them out. There are many boutique wineries for touring and sampling. Besides wine, you will find handmade chocolates, cheeses, breads, dairy goods, and other delicacies for you to taste that will leave you happy and satisfied. Add some charm and romance to your day with a hot air balloon ride, or enjoy the outdoors with a round of golf. 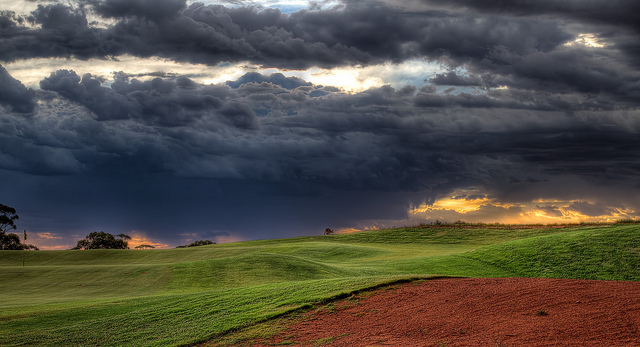 If you’re lucky, you might even spy a kangaroo or two on the course. Fore! One of the best drives in all of Australia starts just south of Sydney and runs along the coast.The Grand Pacific Drive takes you through coastal towns and seaside villages, like Wollongong and Shellharbour. These towns have plenty of things to do and places to visit if you want to pit stop and take a little break from the car. Wollongong Botanical Gardens is a favorite place to stop. 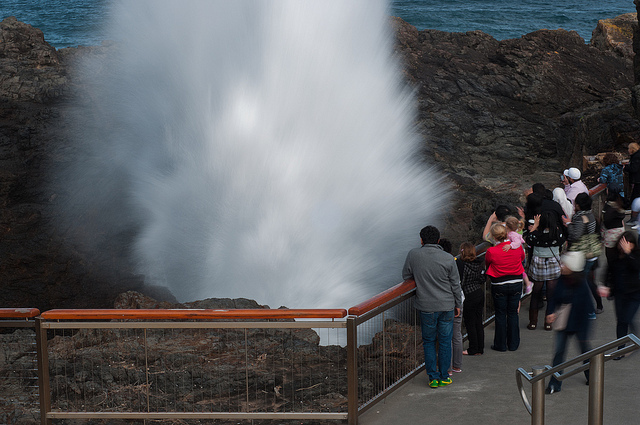 Head out to the Kiama Blowhole and plan according to high tide to see the power of the rock formation and the ocean. Be aware that depending on where you stand on the platforms, you may get wet. Shellharbour Beach is a favorite place to relax, and Warilla Beach has great surfing. The Grand Pacific Drive also traverses along the iconic Sea Cliff Bridge. You may recognize the bridge from its appearances in various advertisements for cars. If you only drive through this portion, it will be well worth your trip. 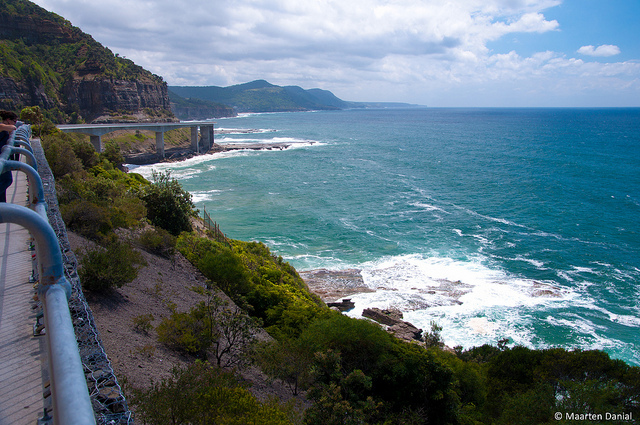 As one of seven offshore parallel to coast bridges in the world,Sea Cliff Bridge offers a unique view of the cliff side and the ocean. Make sure to take along your camera and stop at the south end of the bridge for some amazing shots. Your phone’s panoramic setting might come in handy to capture the scenic views. You can even walk on the bridge if you want to spend more time admiring. Heading north of Sydney on the Pacific Motorway takes you inland through nature reserves and a national park as you take a different scenic route. Take B74 to The Entrance, a popular holiday and beach destination. Its name comes from the position at the entrance to Tuggerah Lake. 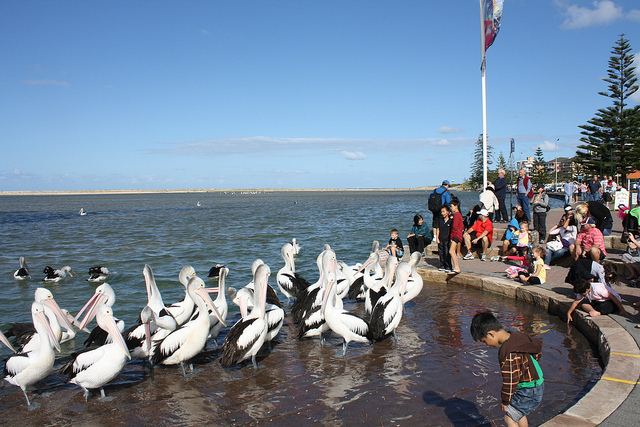 Living up to the nickname of “The Pelican Capital of Australia,” The Entrance is a great place to learn more about these birds as you observe a pelican feeding. There are plenty of opportunities to fish in Tuggerah Lake, or the beaches are accessible to enjoy. For you shopaholics, The Waterfront on the Boardwalk has stores, restaurants, and fountains to enjoy. Last up is a local’s secret of the Northern Peninsula Beaches. Just 35 minutes north of the city, these beach towns are surrounded on all sides by water or forest areas to the west of the towns. While Manly Beach is the most popular destination for visitors, there are beaches all along the coast perfect for surfing, body surfing, swimming, fishing, or sunbathing. You can stop in to Australia’s second oldest national park, Ku-Ring-Gai Chase, and see bush land that has been untouched. Animals such as wallabies and kangaroos may cross your path while you walk through the forested areas. Whether you have time to explore these places outside of Sydney or just drive by, you will not regret taking the time to enjoy Australia’s picturesque nature. BIO: This post was written and provided by IHG Hotels. IHG offers hotels for every type of occasion and has 4,700 properties in nearly 100 countries. 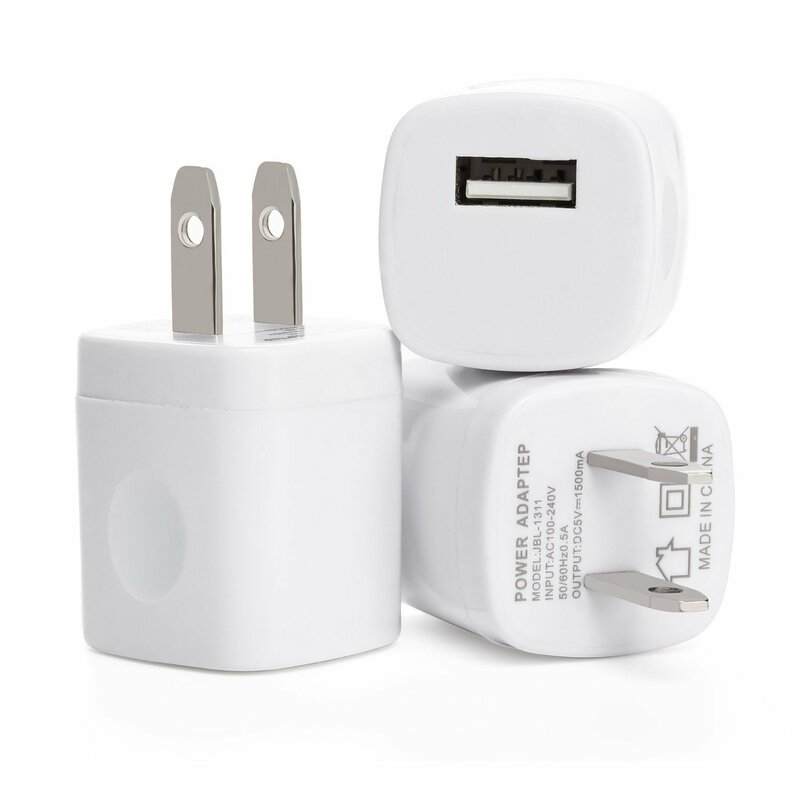 The question we get all the time is: What is the travel gear we are using for our videos, pictures, blogging, etc? 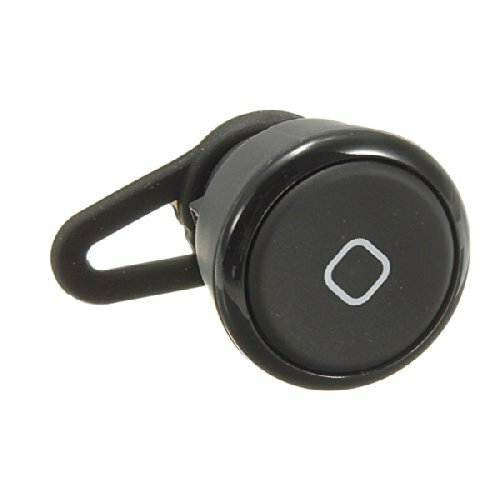 Now besides having a smart phone and using it to check emails and post status updates on social media here are our top ten favorite gadgets we bring with us on the go! Robin Hood, an actual outlaw stealing from the rich to feed the poor or just a fictional character from a story? That is the question. Or at least it is when you find yourself walking through Sherwood Forest for the day. We made our way along the paths in search of an 800+ year old tree called the Major Oak. As we rounded a corner we saw the huge tree standing behind a fence. Unfortunately it’s just now the beginning of spring and while there are plenty of small flowers in bloom a lot of the trees haven’t yet gotten the message. I can only imagine how beautiful this tree would be full of leaves. Nonetheless I thought it was still a stunning sight. This tree has been growing since the founding of the University of Oxford! To our surprise there were tents and medieval re-enactors set up in front of the tree for Easter weekend. This was a very special treat and shows that sometimes you don’t have to plan meticulously for things to work out. I tried my hand at archery in the Sherwood Forest, I just had to make sure the Sheriff of Nottingham wasn’t around to catch me. After checking out all the tents we continued to explore the forest and I realized I had bubbles in my backpack. I kept myself entertained by blowing bubbles down the winding paths of Sherwood. After archery and some bubbles we continued our exploration of the forest and came across a very serene, grassy area. It was a perfect spot to grab a snack and relax at the end of our journey. All in all Sherwood Forest is a great place to visit. Besides a few pounds for parking the park is completely free. You can spend an entire day winding around the paths talking with the old trees. The forest is very old and brings out that relaxed, connected feel to the world. What places make you feel relaxed or part of something bigger? Let us know below! With all of the various types of travel inspiration out in the blogosphere I wanted to share some of my favorite movies that have inspired me to travel. These ten movies are guaranteed to get you itching to plan your next trip to a far off place. Why not start off with a great travel film that has inspired so many travelers and travel writers out there. This movie is probably the progenitor of my travel fever. Who doesn’t dream of learning a little Italian and ordering pizza in Rome or spending time soul searching in India? Not only will this movie inspire you to cook up some new recipes, but it will get you itching to see new sights. Maybe even get you taking a cooking class on your next vacation in a foreign country. This movie had inspired me not only to travel, but to write a blog about our travels. I read all the books years ago and loved them. I must have seen this and the sequel a hundred times. I’m a girl so I’m probably a little biased about this movie, but the shots of Greece just got me wanting to see the Mediterranean! I love Audrey Hepburn! I must have seen all of her movies a million times. Every time I watch Breakfast at Tiffany’s I want to head to New York City. Since we are on the topic of Audrey and, again, I love her movies, here is one that will get you itching to go to Rome. The city has an ancient magic feel that will make you want to be an archeologist. I have a problem, you see. I’ve been to the great city of London a handful of times and I have yet to go to Notting Hill! I know I’ll get there one day and my inspiration to get to the city in the first place comes from way back when I had first seen this movie in middle school. It’s romance, it’s comedy, and it’s about making friends in new places. Perfect. Okay so this one is a cartoon and the method of transportation can’t actually be done in real life…I don’t think? But there is a Paradise Falls except that it is actually called Angel Falls and was the inspiration for the movie. While the show itself will make you want to spend some time in New York City, the second movie will get you wanting to travel to Abu Dhabi. I hear they have gold vending machines out there. I watched this movie as an assignment for my World Religions class in college. Never have I been forced to watch a movie that I instantly fell in love with before. This is my list of travel movies, what’s on yours? Let me know in the comments below.